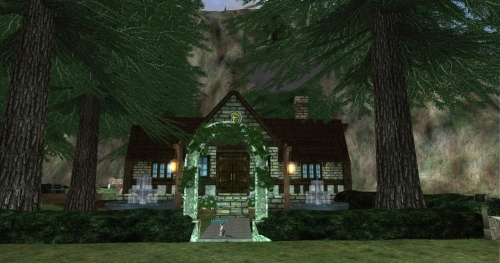 This was my very first house. 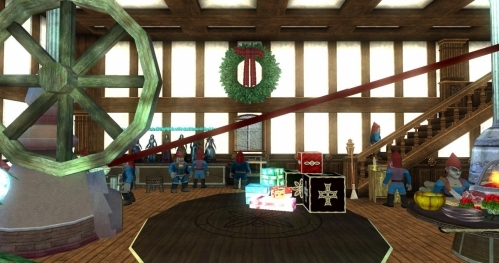 The house was built or designed before some of the cool stuff made by players existed. 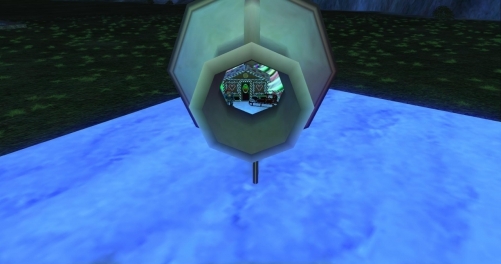 So you had to use items in game to deceive look by placing them upside down, sideways larger or smaller to get a certain look. If you have any tricks to use please post. This House is featured in the panels between zoning screens. And “NO” compensation for my “ART” I gave my rights away to SoE when agreed to play lol. I have a level one toon on each of the servers just to explore and “Steal” ideas from other housing projects. Makes for a pleasant hour or so when I am tired of getting PK’d on Zek. But always looking for new ideas? 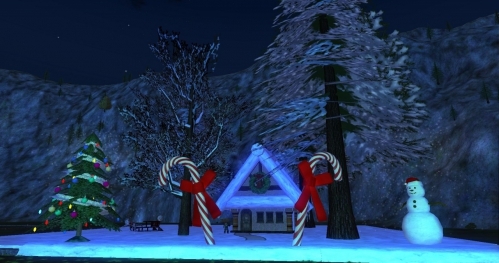 All my houses, about 25+, are located in Cedar Country Meadows, ZEK including the PeaceKeepers guild hall. 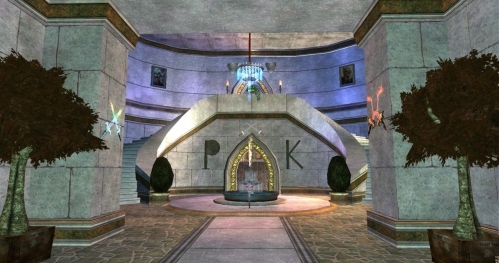 On Zek you can get PK’d in a house or Big Guild Hall so the guild is closed to public. If you have a level 5 or less, arrangements can be made to let you tour. Please contact me either by mail here or on Zek tells. Characters I am usually playing are Armourcarr, trader in bazaar and Vinney my 105. I try to add a lot of detail to make the project look like it is frequently used and real. Come Tour on Zek. In Cedar Country Meadows most of my houses are open. The ones are locked are just used for storage and crafting. Remember there is no PvP until level 5 so if you are lower you are safe. Any zone you can instant camp in is a Safe zone. 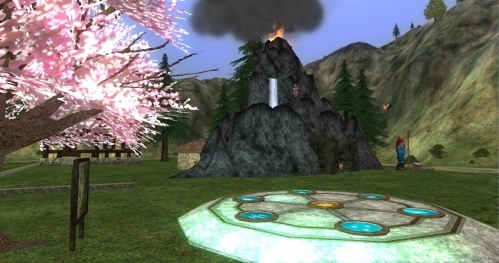 On Zek you have Sunrise Hills, PoK, PoTranquility, Nexus, small Guild Hall & Guild Lobby. Mountain House Link 101 Brimming Heights Cedar Country Meadows Zek. Please feel free to add your own Creations and Art. At times Housing can be very frustrating but also very addicting once you get the hang of it. Picture of the house about same angle used for panel photo between zoning in screen. 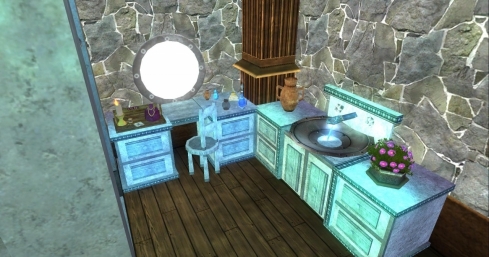 example of items used differently if you see the flower pot is a windmill size increased and put upside-down. 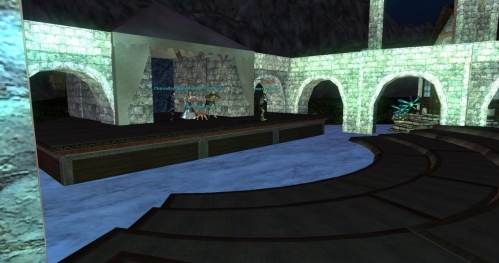 If you tour you can see how I used upside-down gazebos as outside decks. As you enter house. 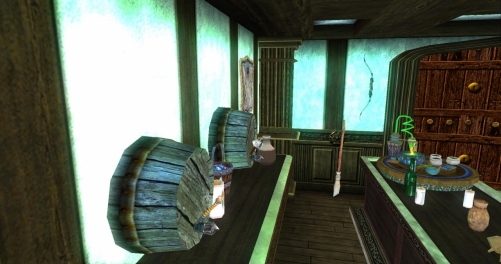 You can see weapons used to make the beer taps on barrels buried 1/2 way into walls. More weapon handles used as containers and bottles. 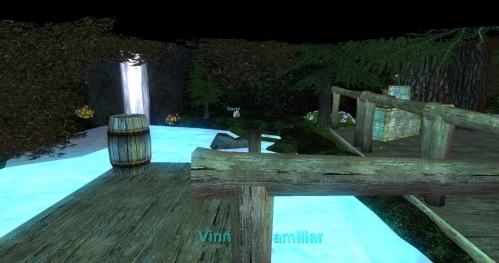 Vinney does amazing things with the housing system in EQ, and has done an excellent job sharing his work here at Zam. It would be great to hear what other people are doing (or did with it) and what kind of tricks they use. 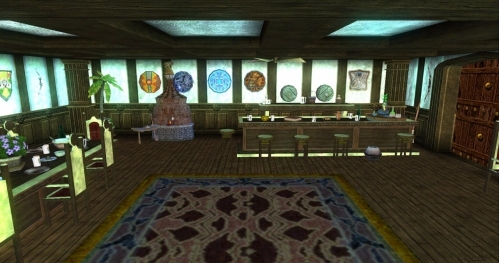 As well, it's my understanding that some EQ housing information that existed in some other places has been lost. Big thanks to Tatankaseventh for compiling several years worth of postings into this thread. I myself have occasionaly logged in to Zek to check out his houses. 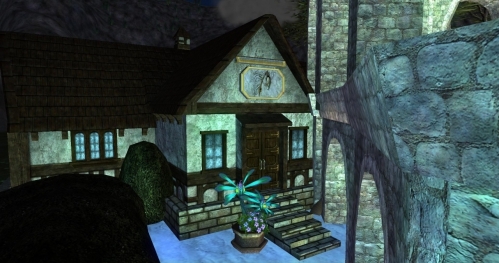 Personally, I'd leave this thread stickied, and I would add a post to link to all of his other threads which he makes showcasing some of the houses he's made. 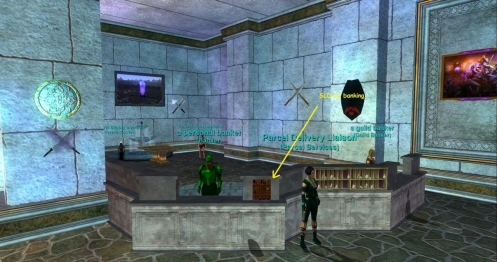 The EQ World Famous Armourcarr Museum. 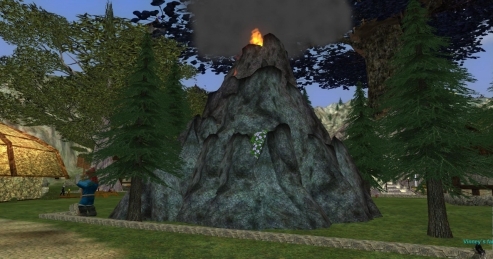 The Volcano as you enter Cedar Country Meadows Zek. I wanted to make an impressive image as you zoned in. 101 Market Street you really can't miss it. The house is closed off and just used as storage. If you look inside the hut the table is set. 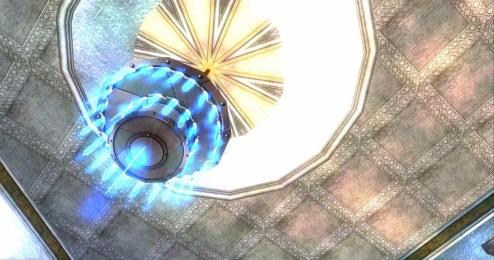 I use Elegant Defiant Round Shields for plates and don't forget to click on the Candy Dish for Stackable Stat Food. The Rock Cliffs were made with Floating Tower of Argath....of coarse upside down and sideways. Your stuff looks amazing as always! I dabble in housing too, although my plots are more experimental than polished. This is a hedge maze I made a while back (click it for the bigger picture). Technically, the maze isn't solvable. You can't get to the house by walking between the hedges. My solution was to put a climbable object in one of the dead ends so that you could step up to the walk on top of the hedges and nagivate it that way. Eventually, though, I realized that you could "jump" the hedges by getting a running start and pushing forward. So much for my cleverness. I tried to put an object in every dead end so that it's not just "blah" when you're wandering around the maze. It's on Vox at 103 Market Street in Elm Colonial Farms if you want to check it out. Eventually, though, I realized that you could "jump" the hedges by getting a running start and pushing forward. Could you stack another hedge on top of each piece of hedge to build it up in height? Good idea! I might have to get that a shot. Looks good Oxgoad. 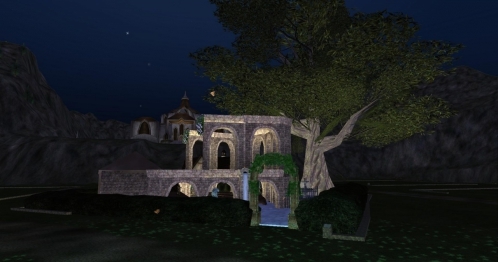 When I built my maze, at the time there were not large rectangles panels to buy, so I used Large Stone Chiseled Counters to cover the top, as a roof, of the double hedges so people could not cheat :D . Also at the time the nice maze hedges were not available. My maze is at 102 Brimming Way Cedar Country Meadows, Zek. Inside the house is a maze also. Remember you can always "Run-a-way" by clicking on the Little square EQ box / Real Estate / Leave Real Estate. You can also just enter house by right clicking any portion of the house and click on Enter. Something a Little Outside the Box…..
Outside Theater with Puppet Show….and in side house the “Fishing Hole” 104 Guild Way, Cedar Country Meadows, ZEK. Owner Jodiarias. Curved Wood Hewn Bench use as bleachers. Elaborate Defiant Quickclaw used as door handles. View as you enter the house. Adiene's Terris-Thule Painting back side used for black sky. 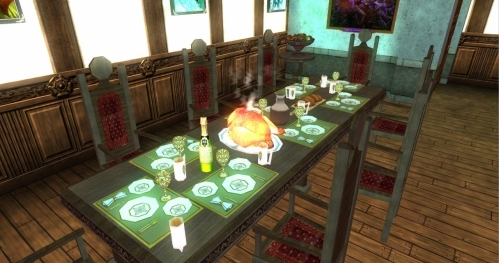 Example: Cooked Turkey made by clicking on an Endless Turkeys item. 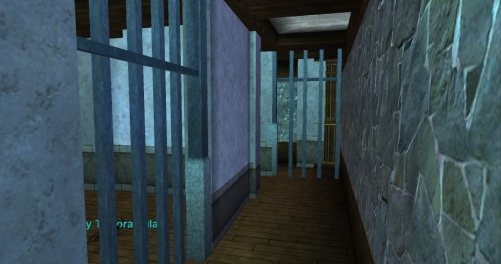 any pole in game can be used to form a support from ceiling. Placing each sword at the right alignment to the shield. a real pain and time consuming. 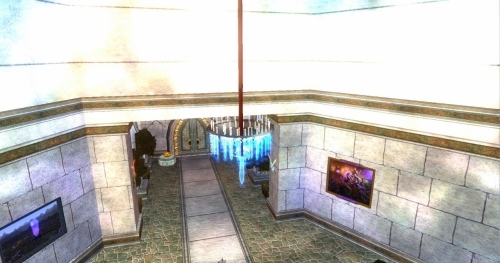 Located at 200 Terminus Heights, Cedar Country Meadows Zek…Guild Hall is locked because PvP on Zek can take place in one’s guild hall… arrangements can be made, to tour, with either Vinney or Armourcarr if on at the time. Bring the Spirit of Christmas year round to Zek. Come check out all the properties. View as you enter the Factory... Hard Hats not required. Taking advantage of resizing items on the Toy Table. PeaceKeepers Grand Guild Hall 200 Terminus Heights Cedar Country Meadows ZEK. 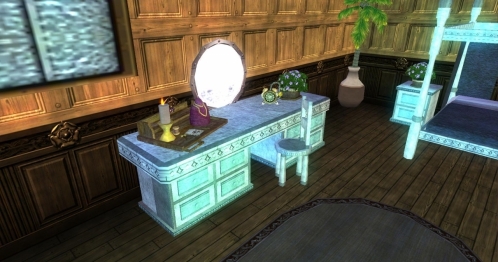 The other Mirrors or items used as mirrors are bought with Station Cash... I am not rich and lot more fun discovering dropped or plat purchase items. And Light Decorative Cookie Plate (50sc) PeaceKeepers Grand Guild Hall 200 Terminus Heights Cedar Country Meadows ZEK. Beautiful Marble Gold-Trimmed Pastry Board (50sc) Dragon House 101 Betwixt Avenue Cedar Country Meadows ZEK. Two used together. 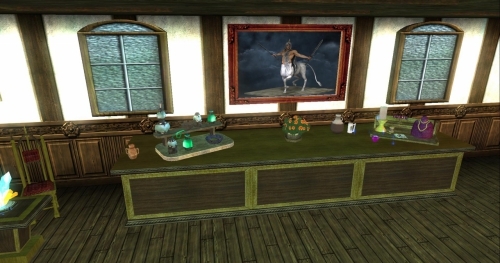 Some of the Paintings that NPC Claire Nybright sells in the Neighborhood Recreation (round) Building have a gold tint if you want that look. 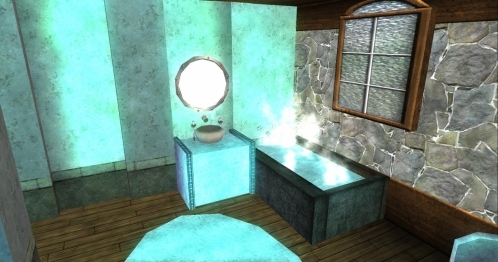 WATER plays a big part in some of my housing creations. Either used as still standing water, water falls or used as water out of a faucet or tap seems to give them life. There are all kinds of fountains & aqueducts. To make big bodies of water I use Flat Rectangle Icy Stone building blocks. Many, many more examples throughout Cedar Country Meadows Zek. Please make a toon on Zek and explore. No PvP until level 5 and the Neighborhood is a safe zone. Please post any ideas or screen shots you have of the use of water in the Neighborhoods. Can always use Ideas! Made with the Koi Pond purchased with sc. Located at Aquarium at: 103 Market Heights Market Heights Cedar Country Meadows Zek. Owner Gonefishing. 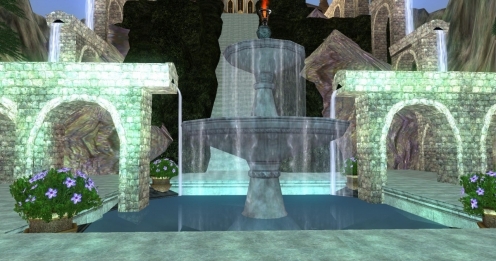 Entrance to PeaceKeeper's Guild Hall made with Aqueduct Terminus and Cascading Stone Fountain. 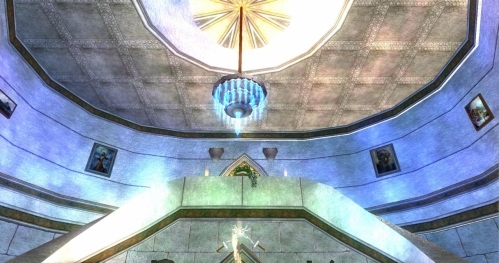 Peace Keepers Guild Hall is located at 200 Terminus Heights Cedar Country Meadows Zek. 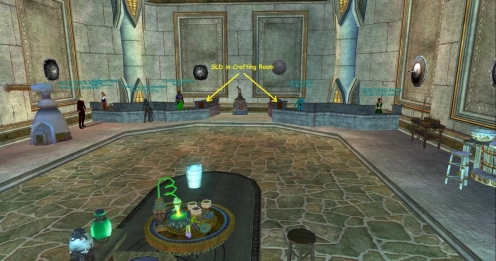 Guild Regeneration Pool in PeaceKeepers Grand Guild Hall. I used Building Block – Flat rectangle – Icy Stone to make the water..
Castle Moat made with Flat Rectangle Icy Stone building blocks at 101 Market Heights Cedar Country Meadows Zek. Owner Zemanova. 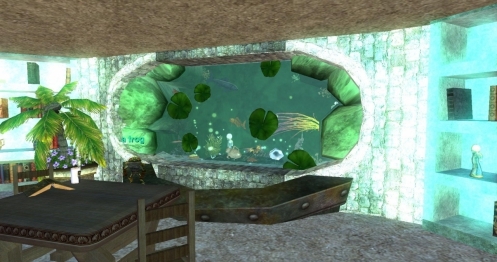 Images of the Cave house. Hello, I have been using ZAM for a long time now and greatly appreciate the posts to help w/ quests, etc. I suppose it's finally time to post my own. First off I need to ask a Q before it gets buried in my chatter. My guild recently bought a modest hall and is under construction. The Q i have is, when u exit it to sunrise hills u get punted to the border of the plot. I wonder if this is because the pep who "unfolded " the hall was standing here and if we could change the location some how, I know how to move the whole thing 'round the plot but would want it in the near center of the plot tho not where it currently puts you.I attempted to move it but was after we started adding to the plot, i did manually "save all" and returned it back when i realized none of the other stuff would move w/ it such as the light fixtures i added. I have not done much to the outside yet, focusing on the interior where more can appreciate it. I greatly appreciate Vinney's posts that gave me a lil inspiration and have many ideas of my own. I would share screenshots when more progress is made to inspire others. I took one of 2 toons sitting on the bed of the 2nd floor master bedroom watching "The Hobbit" on Tv (opps, thats a secret, gnomes have been tinkering them for years just waiting for peps to appreciate the other things they can make). It's been a week but have found it very addictly fun. I began looking for placeable items and seeing what would look cool, then looked outside the box and found uses for alot of stuff. Shivs from dulaks have alot of uses pushed deep in walls and other objects such as the flush handle on the toilet.....yep in the bathroom. Lightstones are cool but being round the tend to look like a Disco ball, hate disco. We have a few items that guildies got from "free" SC w/ membership but mostly i used items found in the game and I and guildy fletch and jewelcraft furniture.I could go on and on but half the fun for me was researching items, finding out where it drops,farming it, placing it, spinning it 'round and realizing i can use it for more then just what i wanted it to begin with, luckily i brought back a dozen of them, hehe. I did find it frustating that there are 2 'stone block" one used to jewelcraft furniture and one is placeable, guess the DV's did n't think of the obvious again......I would love visitors and to visit others.I am on FV server, <weapon of mass destruction> Tinel, Tinele,Tinely,Tinelisely but have others on Drinal and room to create toons to visit other servers. Hello, I have been using ZAM for a long time now and greatly appreciate the posts to help w/ quests, etc. I suppose it's finally time to post my own. First off I need to ask a Q before it gets buried in my chatter. My guild recently bought a modest hall and is under construction. 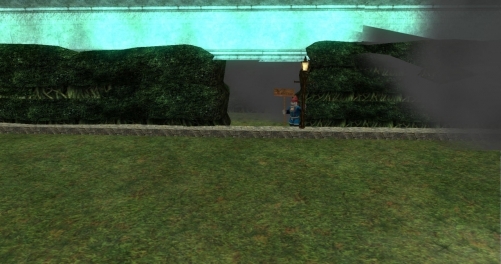 The Q i have is, when u exit it to sunrise hills u get punted to the border of the plot. I wonder if this is because the pep who "unfolded " the hall was standing here and if we could change the location some how? I can't answer this, but surely others can? I know how to move the whole thing 'round the plot but would want it in the near center of the plot tho not where it currently puts you.I attempted to move it but was after we started adding to the plot, i did manually "save all" and returned it back when i realized none of the other stuff would move w/ it such as the light fixtures i added. I have not done much to the outside yet, focusing on the interior where more can appreciate it. I greatly appreciate Vinney's posts that gave me a lil inspiration and have many ideas of my own. I would share screenshots when more progress is made to inspire others. I took one of 2 toons sitting on the bed of the 2nd floor master bedroom watching "The Hobbit" on Tv (opps, thats a secret, gnomes have been tinkering them for years just waiting for peps to appreciate the other things they can make). It's been a week but have found it very addictly fun. I began looking for placeable items and seeing what would look cool, then looked outside the box and found uses for alot of stuff. Shivs from dulaks have alot of uses pushed deep in walls and other objects such as the flush handle on the toilet.....yep in the bathroom. Lightstones are cool but being round the tend to look like a Disco ball, hate disco. 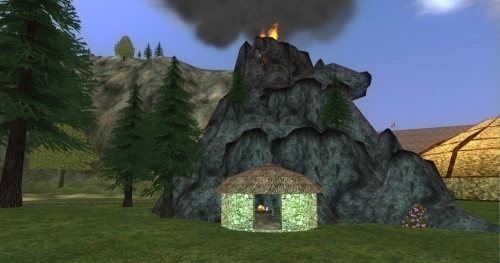 I would love visitors and to visit others.I am on FV server, <weapon of mass destruction> Tinel, Tinele,Tinely,Tinelisely but have others on Drinal and room to create toons to visit other servers. Today our guild bought a 4 plot neighborhood so others can have their houses next door, only 4 since only 1 was so interested. We, me especially, was a lil nervous but with an estate crate, u can pack everything up, the interior and then the exterior then the house and unpack in your new plot. the answer to my own Q was slightly answered, it seems u will always be put in a corner of your yard when u exit from interior. When u stand with the plot purchase plaque/stone thang to your right, the zone spot is to your left in the corner of the property.When u place the house and position it so front door faces u there, its not so bad when u zone out of it. 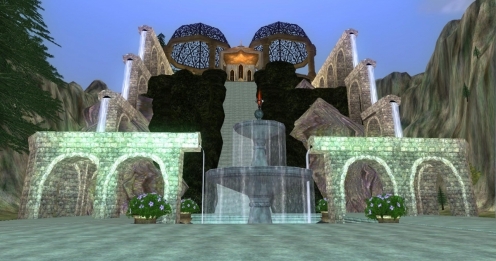 Then load a previously saved version of your yard and all items will be back prior to the move. Do the same for the inside and all your work wont be lost,,,PHEW!! 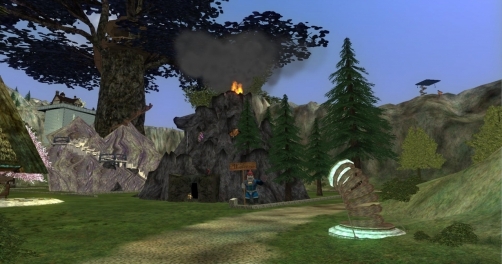 When u do buy a neighborhood, i suggest visiting them 1st as we did like Terminus as the GH is up on a hill farther away from player plots as brimming is closer to them and on the same plane. Hope this helps and looking forward to any feedback others may have. 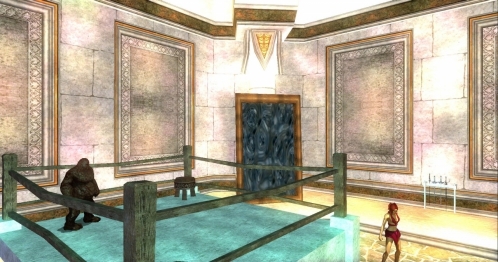 1 - I always get booted to the far back corner when I exit the guild hall normally. Fortunately, I rarely exit that way. And that's most certainly NOT where I placed it from. 2 - Paragraphs are your friend. That question was as far as I got. I believe it is a fixed zone out. Just like you would appear in any zone coming in. So you are stuck at that location. 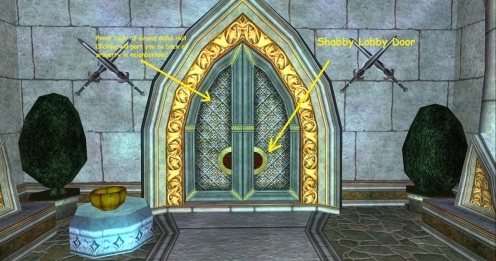 Remember you can use the Shabby Lobby Door to port to GL and place them in strategic spots in the guild hall. 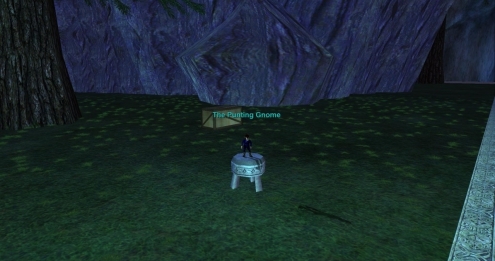 I also put a The Punting Gnome by the port in spot from the Guild Hall so you can click on him. Clicking on door sends you to neighborhood. Clicking on the Shabby Lobby Door in handles of front door ports you to guild Lobby. Have also doors in guild porter room & far back wall of guild hall. 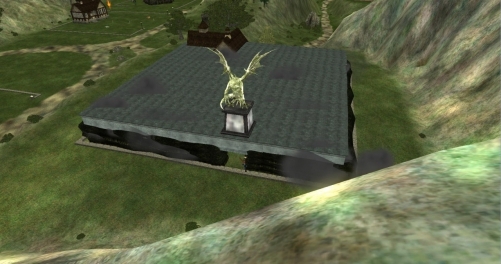 Nothing like a good swift kick to get you flying to the recreation building (round NPC building) area in neighborhood. Remember to post Address: Property address, Neighborhood and Server and Owner helps also. Love to go tour others. Toured today. Fantastic job. like what you did with the guild healing pool. Thanks for posting and keep up the creative work.